Twangy rock 'n' roll with heart and soul (not to mention a slight sting), Red Star Belgrade's third full-length is a from-the-ground-up country rocker complete with all the trimmings: songs about musical influences ("Uncle Tupelo"), drinking ("the bottle"), and bad relationships ("Long Cold Day"). The title track gets things going with the hopelessly lost opening lines ("You are so might and so high/ I couldn't see you with a telescope") before injecting some self-confidence and confessing that "I look forward to the day/ When you will sit up and beg for me." The simmering country of "Dreaming 'Bout You" is followed by the sliding "Strum 'n Rhyme"; then the crying-in-my-beer of "Nixon Stamp" finds you weeping with the pedal steel and stumbling along with the rhythm section. The tender flaws of "After the Revolution" tells the tale of broken dreams, lost hope, and struggling through life; the piano ballad "Long Cold Beer" gets you thinking of that lost love that you crave but previously threw away; and "Uncle Tupelo" injects some happy rock as good times are remembered through artists like Uncle Tupelo and Gram Parsons. Stinking of beer and stale cigarettes from long nights at the bars around town, Red Star Belgrade's brand of country and rock are both seeded in the soil of America. 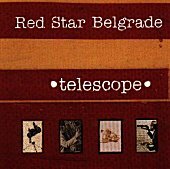 Hard working, but never getting the breaks, and struggling through life, Red Star Belgrade rolls with the punches and keeps on drinking the scars away and making good music to exert the demons from their minds. Telescope is a prime example of the soul that is lacking from current music - rock and country alike. I'll give it an A-.